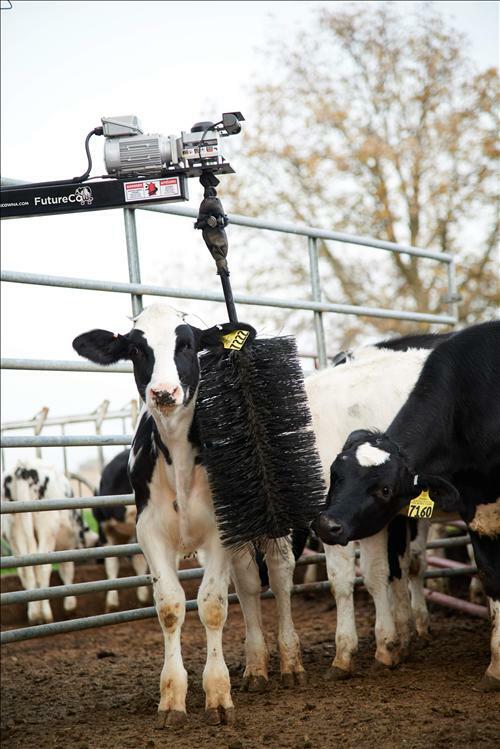 FutureCow introduces ComfortBrush for calves, the first automated brush designed specifically for calves to enrich calf development. Recommended for use in calves that are two to six months of age, the FutureCow ComfortBrush for calves has been shown to reduce stress, exfoliate the skin, decrease fly and parasite stress and create a more comfortable environment. * A motion sensor that activates upon movement instead of touch. * An exclusive omni-joint that allows calves the freedom to move the brush where they see fit. * A counter-rotating safety feature that allows the brush to spin in the opposite direction once the overload is triggered. * Adjustable features, such as speed and overload sensitivity. * A stationary gearbox and motor that drastically reduce wear and tear. * Multiple electrical options are also available for ease of installation.